Don’t eat candy for dinner? Don’t tell that to fish following and about to bite a Blue Fox® Classic Vibrax® in a new Candyback color combination. 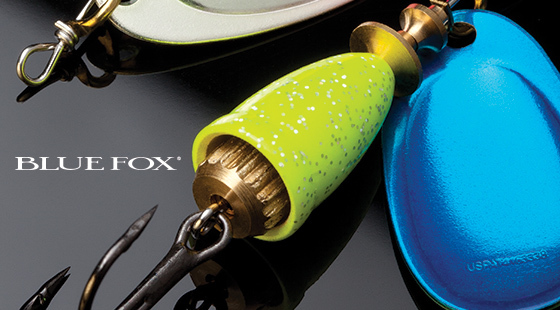 Blue Fox’s new Candyback Vibrax baits combine three complementary color flourishes: a colored bell accented with metallic flecks; a shiny front side of the metal blade tipped with a color that matches the bell; and a transparent, fluorescent complementary color covering the blade’s back side. Six Candyback color combinations are available: Chartreuse Green Candyback, Orange Chartreuse Candyback, Pink Chartreuse Candyback, Chartreuse Blue Candyback, Black Chartreuse Candyback and Cerise Purple Candyback (Cerise is a deep, vivid reddish-pink). In the names, the first word indicates the bell color; the second word designates the blade-accent color. A tried-and-true fish catcher, the Classic Vibrax features fine tolerances, super-sharp hooks and a low-frequency-emitting, patented two-part body, which comprises a machined-brass bell and a stainless steel shaft. The key feature is the unique, namesake Vibrax bell, which emits sonic vibration when a free-turning gear rubs against it. An in-line spinner, a Classic Vibrax will run 2-to-6 feet deep, depending on lure and line size. It’s available in four sizes: 1/4 ounce with size 3 blade; 3/8 ounce with a size 4 blade; 7/16 ounce with a size 5 blade; and 5/8 ounce size 6 blade. This entry was posted in Blue Fox. Bookmark the permalink.